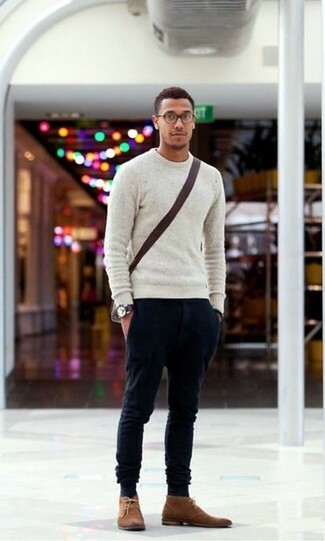 For an outfit that provides comfort and fashion, consider teaming a grey crew-neck sweater with black chinos. When it comes to footwear, this look pairs wonderfully with Calvin Klein rueben chukka boot. 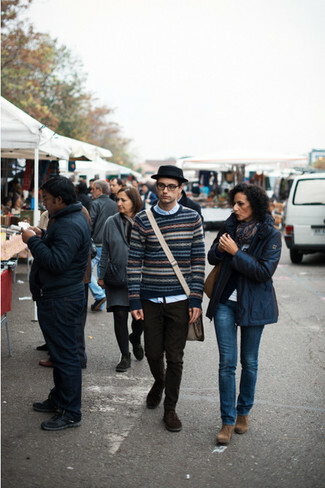 If you're looking for a casual yet sharp outfit, dress in a navy fair isle crew-neck sweater and dark brown chinos. Both garments are totally comfortable and will look great together. Got bored with this ensemble? Enter Calvin Klein rueben chukka boot to jazz things up. If you're looking for a casual yet stylish look, team a navy denim jacket with navy jeans. Both garments are totally comfortable and will look great together. 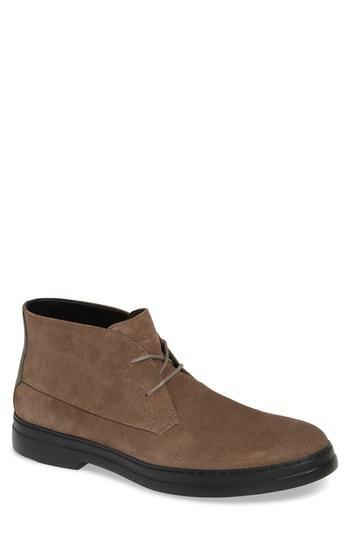 When it comes to shoes, this look is round off nicely with brown suede desert boots. If you're searching for a casual yet dapper getup, wear a blue denim jacket with dark green chinos. Both items are totally comfortable and will look great paired together. When it comes to footwear, this look pairs nicely with Calvin Klein rueben chukka boot. For a nothing less than incredibly stylish ensemble, try teaming a blue chambray dress shirt with navy dress pants. For something more on the daring side to round off this ensemble, opt for a pair of Calvin Klein rueben chukka boot from Nordstrom. 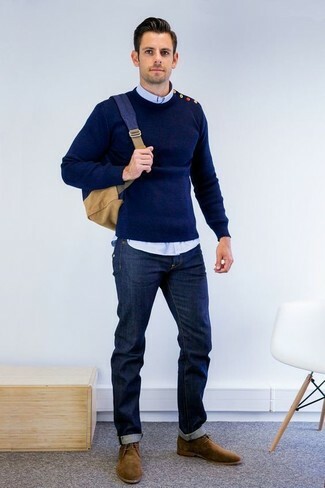 This combination of a navy crew-neck sweater and navy jeans is so easy to pull together and so comfortable to sport all day long as well! When it comes to footwear, this getup is complemented wonderfully with Calvin Klein rueben chukka boot from Nordstrom. 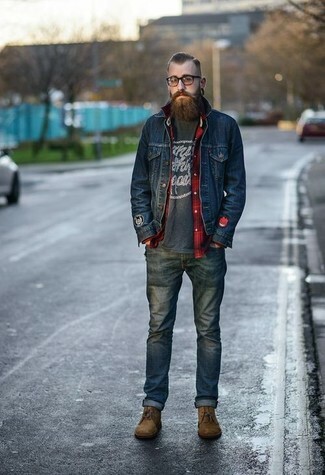 If you're on the hunt for a casual yet dapper look, try teaming a navy denim jacket with black jeans. Both pieces are totally comfortable and will look great together. When it comes to shoes, this getup is complemented wonderfully with brown suede desert boots. 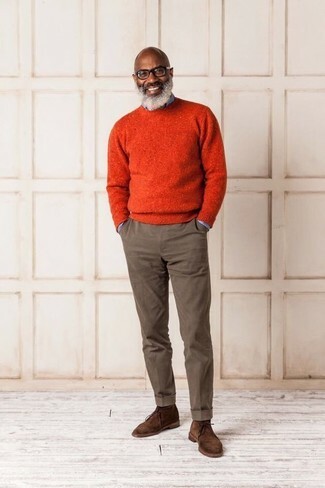 If you're hunting for a casual yet dapper outfit, wear an orange crew-neck sweater with brown chinos. Both pieces are totally comfortable and will look great together. 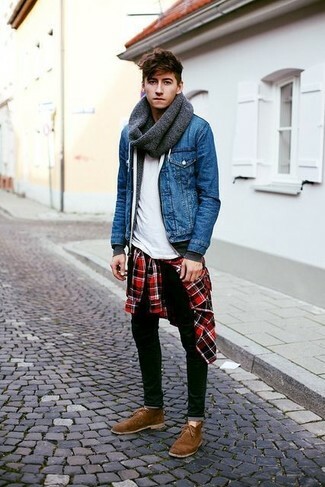 Balance this look with Calvin Klein rueben chukka boot. If you're in search of a casual yet on-trend look, opt for a dark brown leather bomber jacket and grey chinos. Both garments are totally comfortable and will look great paired together. When it comes to footwear, this ensemble is complemented wonderfully with brown suede desert boots.